Today only, while supplies last, Best Buy is offering this Emerald - 4L Analog Air Fryer for ONLY $29.99 (Retail $59.99)! Reduce the oil when making fried foods with this 4L Emerald air fryer. The twist-knob temperature controls and 30-minute timer let you precisely control the cooking process, and the slide-out food basket makes post-frying access convenient. 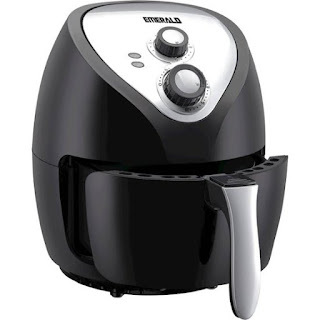 This 1400W Emerald air fryer has a nonstick basket and pan for smooth food release.